The 466 men who have held the increasingly demanding and prestigious position of Head Coach in the National Football League and the two leagues that merged into it (the All America Football Conference of the 1940s and the American Football League of the 1960s) form an exclusive club. 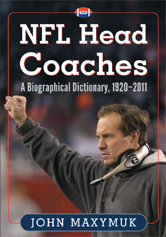 This book essentially answers three questions about every professional head coach since 1920: Who was he? What were his coaching approach and style, in terms of both leadership and gridiron tactics? How successful was he?